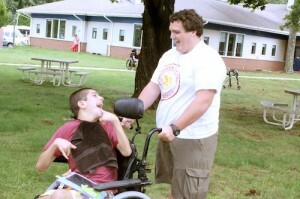 Centenary student Anthony Pare sharing a humorous moment with Matheny student Mark O’Connell. Every semester incoming students at Centenary College in Hackettstown, NJ, take part in a day-long community service project called the Community Plunge. The project is mandatory for all new students and offers them a selection of different sites at which they can volunteer. This year’s Community Plunge was held on Monday, August 26, and Matheny was one of 18 different organizations that were included. 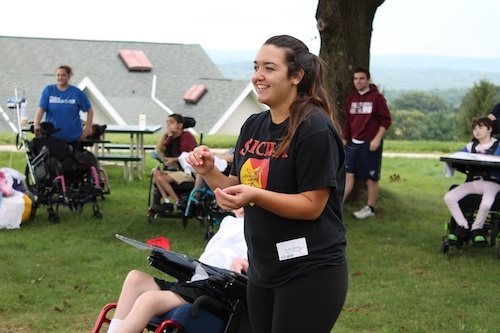 The students spent the entire day participating in several recreation therapy activities including relay races and adapted sports. Recreation therapy at Matheny provides our students and patients with a variety of recreation opportunities and resources to improve their physical, emotional, cognitive and social well being. Volunteers are needed to help out in recreation therapy activities evenings and weekends. Volunteers can serve as recreation assistants, classroom aides, tutors or just friendly visitors. For more information, call Gail Cunningham, at (908) 234-0011, ext. 282; or email her at volunteers@matheny.org. Centenary student Nicolena Marrero getting ready for a catch in the egg in toss competition. This entry was posted in Uncategorized and tagged Centenary College, Community Plunge, volunteer. Bookmark the permalink.